hey everyone! 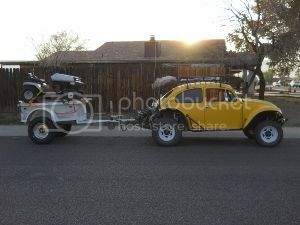 i jus got this 69 1600cc baja buggy and wanted to beef it up quite a bit. i got a 2.2 ecotech engine that i'll be doing an engine swap with (any tips plz reply) and wanted to put long travel in the front adding a few inches on both sides in the front, as well as will be rewelding a lot of the frame since whoever did it before didn't do very good welds. any advice/tips/recommendations? As it is right now it handles great in dirt, but I want to beef it up to handle in sand and dunes as well, hence the engine swap longer aarms, new shocks, etc. This is my first project so any/all advice is appreciated! I have an ecotech 2.2 in my 10 car. Plan on a bus box upgrade with a quality gear stack. If you plan on going fast in the dirt plan on some rear suspension work to handle the new power and torque. Check out the "my 69 project" thread on Daltons car. He will have some very good insight on cooling problems using a radiator on a bug. Good luck with your project. Looks like you are starting off with a solid platform. Looking forward to seeing lots of pics. Well I see that you have indicated on here that you live in the Sandy Eggo area. I asked on SoCal. Do you have any other photos of the car? Save your self a lot of trouble... Put the radiator up front in the air flow... it looks like you have the room..
Keep it a VW baja, use an air-cooled VW engine.